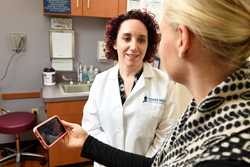 - Babyscripts, the leading prenatal app and the first mobile clinical tool to allow obstetricians to remotely monitor their pregnant patients’ progress and health, has announced an expansion with UT Physicians after a successful pilot program. UT Physicians is the clinical practice of McGovern Medical School at The University of Texas Health Science Center at Houston (UTHealth). The Babyscripts mobile app will now be offered to all obstetric patients to enhance their knowledge, experience and clinical care. Babyscripts™ improves the quality of pregnancy care beyond the OB-GYN office visit. The app uses insights and advice approved by the American College of Obstetricians and Gynecologists (ACOG) to support and educate patients throughout their prenatal journey. During the initial pilot program, the Houston area was hit by Hurricane Harvey, which was a critical time to provide expectant mothers with up-to-date information regarding care. UT Physicians obstetricians, in addition to the Babyscripts team, were able to leverage the real-time communication ability of the program to push out important information to patients during the disaster. Over the course of three days, patient engagement in the mobile app increased 430 percent, driven by multiple sessions per day. Babyscripts is a virtual care platform for obstetrics that allows physicians to deliver a new model of prenatal care. The platform is powered by a suite of mobile apps that drive better patient decision-making, internet-connected devices for remote monitoring, and a host of population health tools to give providers access to patient data in real time. When using these tools, patients experience increased engagement and satisfaction, while OBGYNs are able to identify patient risk more quickly and improve clinic workflow. UT Physicians, one of Houston’s largest physician practices, offers multi-disciplinary medical care at its flagship location in the Texas Medical Center, as well as at community-based health centers throughout Southeast Texas. The team of internationally recognized medical experts includes more than 1,500 clinicians certified in 80 medical specialties and subspecialties. UT Physicians is the clinical practice of the John P. and Kathrine G. McGovern Medical School at The University of Texas Health Science Center at Houston (UTHealth).